Top side view of the teapot. Description: This teapot is part of an entire set, which included a covered sugar bowl, four teacups without handles in addition to the teapot. The hand painted design is of an orange and blue boarder and a red rose with flanking green leaves. 3-D Scanning Process: We used the MakerBot scanner for this object. 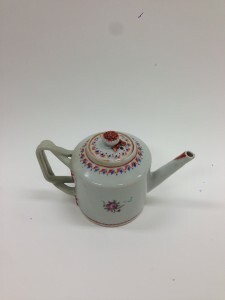 It was able to pick up a lot of the detail from the teapot, aside from the painted work. Due to the positions of the lasers, the very top of the handle did not make it into either of the multiple scans the MakerBot combined with the multi-scan feature. Because the object is so important and historical, we were unable to place it on its side, which would have given us the missing portion of the object in the scan.